Every few months, The Michigan Hill Chefs Association (MHCA) hosts a Chefs’ Dinner, a themed sit-down multi-course meal for 12 – 16 friends. There are four members in the Association: Cbk is the Dessert Sorceress. CD is the King of Seafood. CS (married to CD) is the Magician. And then there’s me. We even have chef’s jackets embroidered with our names and the MHCA logo to wear during our events. My husband was feeling left out, I believe. And I think he was more than a little jealous of the jackets. But just because he throws a half bottle of Chianti into jarred marinara for his famous turkey spaghetti, that doesn’t mean he’s worthy of a jacket. The Chefs and I took pity on him and gave him an assignment for the next dinner. His task? Minestrone Soup. The theme was Northern Italian, so we thought we’d give him something that he couldn’t mess up, basically vegetable soup. But in order for him to fulfill the task, he needed a little coaching. A few weeks before the event, we made the soup. I patiently explained to him the difference between dice, slice, chop and mince. I showed him how to hold his knife correctly, with his index finger curled over the blade and the rest of his hand firmly gripping the handle. I told him why the vegetables needed to be cut the same size, saying that it wasn’t just about how the soup looked, but it was also important because the vegetables needed to cook evenly. He was a very good student and the soup came out perfectly. It was beautiful. The next week, we did it again. This time, he insisted on flying solo. I was sitting at the kitchen table reading a magazine when I heard it. “What are you doing?” I said, acting all nonchalantly as I walked over to him. As I got closer, I was horrified to see that he’s wasn’t holding his knife correctly. His other hand, fingers extended, was dangerously close to the chopping action. And the vegetables he’s chopping? A sloppy mess. Before I know it, I’m yelling at him, “That’s not how I told you to hold the KNIFE! You’re chopping too fast! That’s not a dice! That’s a mince! You’re not doing this right!!! JEESH – YOU’RE GOING TO CUT YOUR FINGER OFF!! !” I became Gordon Ramsey, minus the profanity (well, OK, maybe there was a little profanity). Right in front of my eyes, my wonderful, successful and gorgeous husband became a three year old. You can guess how it all turned out. The soup was visually unappealing. Some of the veggies were mush. The carrots, which were supposed to be diced, ended up sliced as big and thick as my thumb and weren’t cooked through at all. It wasn’t good. This was a problem. He’d been to previous dinners and he knew the level of quality the chefs provided. For crying out loud, I was making Poached Egg Ravioli in Truffle Butter Sauce as a starter for this dinner. What would everyone think once this brown messy soup with giant chunks of uncooked carrot appeared at the table? I needed help. I needed the Chefs. I emailed everyone that night, telling them what happened. I replied, “AJASCIT!” We MHCA members love our acronyms. Clearly the chefs would be no help. I would just have to suffer the embarrassment of AJASCIT feeding our guests not-so-good soup. The evening of our Italian dinner, I kept praying that the Fritto Misto, the Poached Egg Ravioli, all of it would make our guests forget the Minestrone Soup. But AJASCIT would have none of that. When the soup was served, he went on and on and on, telling everyone every single small detail of the recipe. He was throwing around phrases like “mise en place” and bragging about his excellent knife skills. Everyone said that they loved it – of course. The Chefs looked down at their bowls and then at me. I knew what they were thinking: The damn carrots weren’t cooked. 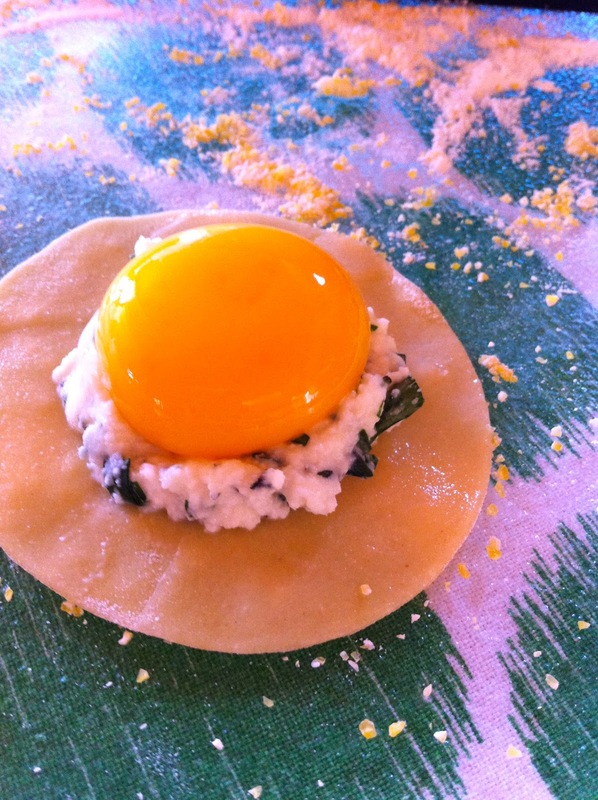 Next up… My Poached Egg Ravioli. I worked for weeks perfecting my homemade pasta and my technique. This dish was the BOMB. I served it and they ooohed and ahhhed and exclaimed it to be one of the most delicious and unusual things they’d ever eaten. “But my soup was really amazing, wasn’t it?” AJASCIT wouldn’t shut up about that stupid soup. Jesus. I just served a friggin’ POACHED EGG IN A RAVIOLI. Months later, AJASCIT/Tahiti still talks about that soup. And I still tell him that his carrots were wrong. · Combine the tomatoes, wine & broth in a medium saucepan. Bring to a boil and reduce heat to medium low. Reduce by half. Season with salt & pepper. Combine the mozzarellas, Ricotta, Parmesan, pesto and egg. Season to taste with salt & pepper. · Line a cookie sheet with foil and sprinkle the cornmeal evenly over the foil. It will not cover the sheet completely. This is to keep the ravioli from sticking to the sheet. · Set out four wrappers and cover the rest of the package with a towel to prevent them from drying out. Brush the outer edges with a little water and place one teaspoon of the cheese mixture in the center. Fold in half to make a triangle, trying to pinch out as much air as possible. Make sure the ravioli is completely sealed. Place on the lined sheet. Repeat. Do not let the triangles touch. · Bring a large pot of heavily salted water to a rolling boil. Place eight to 10 ravioli in the pot. Stir gently. Cook 2 minutes or until the ravioli float to the top and the edges are translucent. · Carefully remove cooked ravioli with a slotted spoon. Place three ravioli on a small plate, top with 2 Tablespoons of sauce and garnish with a pinch of chopped basil and a couple of Parmesan shavings. · Repeat with eight to 10 more raviolis. Sauce & garnish as directed. Serve. · * Diced means small cubes. Not big honking hunks. · Use wine you would drink. For goodness sake, please don’t use “cooking wine.” If you are uncomfortable using alcohol in your recipe, double the chicken stock. · Shave curls of Parmesan using a vegetable peeler and a wedge of fresh Parmesan. · Ravioli can be made ahead. Freeze uncooked ravioli on the cookie sheet. Once frozen, remove them and place them in a zip lock baggie. Take out as many as you need and cook as directed. If you don't want to peel & seed a tomato (very easy - email me directly for directions), it's OK to use a drained can of diced tomatoes. I think AJASCIT needs his own apron. sorry, mom is right - she made breaded chicken and occasionally she used robusto italian dressing. Dad even said the same thing. You lost 3-1. I'm sticking to this story. You are all delusional. And he'd be absolutely adorable as my sous chef. But I'd still keep the knife away from him. I have to know......what does AJASCIT think of this story? This almost easy enough for me to tackle....when it gets cooler outside. He's embracing this. He knew his moniker long before this post, but the post itself was a surprise. We're now thinking about a line of aprons with AJASCIT on them. Haha! Technical difficulties are preventing us from posting videos at this time (I seem to be having an inordinate amount of bad hair days), but I will post soon. Hopefully after a fabulous manicure. I thought I knew who this might be and then I realized I had more than one friend with these initials... If you have a google account, you can sign in under your google name. If you have a blogger account, you can sign up under that name . Or you could be like my mom, who just told me that she was my mom.